Le Bel in 1874 and van 't Hoff in 1894 were the first to propose the possibility of asymmetric synthesis with left- or right circularly polarized light. Cotton of the Cotton effect was the first one to try (photolysis of an alkaline solution of copper tartrate) in 1896 but failed. Kuhn in 1929 was the first to succesfully conduct a photodestruction experiment with ethyl-alpha-bromopropionate and others followed like Mitchell 1930 with the dinitrogentrioxide adduct of humulene DOI and with chloro-nitroso-diphenylbutane in 1944DOI. In both experiments left or right handed CPL yielded an maximum optical rotation of opposite sign at 50% conversion. Several attempts were launched at true photochemical asymmetric synthesis starting from racemic substrates between 1933 and 1945 but these attempts suffered from low optical yields and irreproducibility. 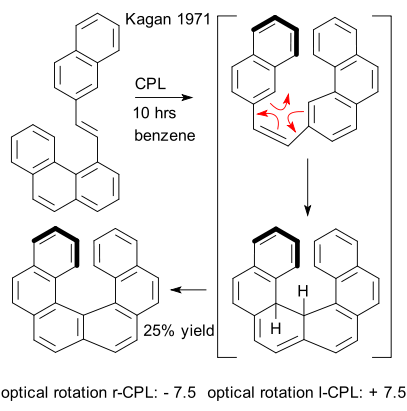 Karagunis in 1930 added chlorine to an unsymmetrically substituted triphenylmethyl radical DOI, Davis in 1935 brominated and chlorinated trinitrostilbene ( DOI) ( DOI) and in 1945 reported the bishydroxylation of diethyl fumarate with hydrogen peroxide ( DOI). The first verified photochirosynthesis was obtained with photochemical formation of an helicene by Kagan in 1971 ( DOI DOI DOI DOI). This reaction is a trans-cis isomerisation followed by rearrangement reaction and oxidation. Calvin in 1972 was scooped (DOI DOI DOI) but extensively investigated helicene formation mechanism.